Metropolitan Room Manhattan, NYC, music, jazz, jazz club, jazz nyc, jazz clubs nyc, jazz, rock, nyc, music, manhattan, times square, jazz club, rock club, nyc rock club, nyc jazz club, live music, entertainment, music, best cabaret clubs in nyc jazz :: Laurie Krauz & The Daryl Kojak Octet - "Tapestry Rewoven"
Laurie Krauz & The Daryl Kojak Octet - "Tapestry Rewoven"
Laurie Krauz and the Daryl Kojak Octet return for one very special night with their widely acclaimed and Bistro Award-winning Carole King tribute, “Tapestry Rewoven.” Join the band as they kickoff the Campaign to Record the award-winning "Tapestry Rewoven!" “Tapestry Rewoven” is a thrilling jazz, blues and R&B-infused re-imagining of the Carole King classic, “Tapestry.” Heralded as “brilliant,” “genius” and “a hurricane of entertainment,” the tribute show presents novel interpretations of the iconic original in its entirety and has been touted for being fresh, new and musically inventive — while still being reverent to the brilliance of the original. Experience “Tapestry Rewoven” and Feel the Earth Move! Laurie Krauz thrills audiences with her award-winning, blues-influenced jazz vocals and her powerful emotional range. 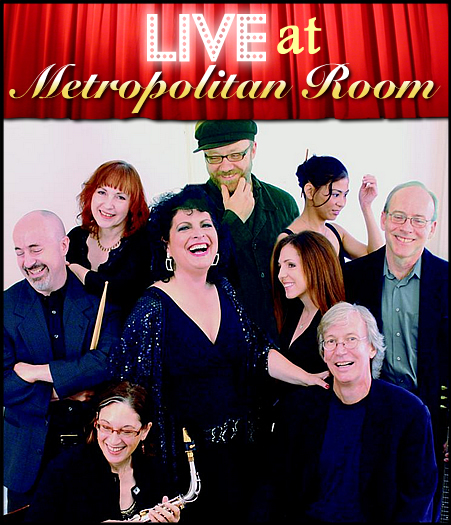 Named one of the top 500 jazz vocalists of all time in a book by noted jazz critic Scott Yanow (“The Jazz Singers”/Backbeat Books), Laurie has played to standing ovations at legendary venues such as JVC Jazz Festival, B.B. King Blues Club, The Blue Note and Iridium. She is a three-time Female Jazz Vocalist MAC Award winner; and, along with Daryl Kojak, was honored with a 2009 Back Stage Bistro Award for their hugely popular show, “Tapestry Rewoven.” www.lauriekrauz.com; www.tapestryrewoven.com. Daryl Kojak has worked on the New York music scene for more than thirty years as a pianist, producer, composer, songwriter, arranger and musical director in an array of genres including jazz, blues, gospel, rock, R&B, pop, classical, new age and musical theatre. He has performed with jazz luminaries George Coleman, Warren Vaché and Cameron Brown, and has played On- and Off-Broadway and in clubs with Sandra Bernhardt, Vicki Sue Robinson, Carmel Quinn, Robin Williams, Billy Crystal, Tiny Tim, Catherine Russell, Luba Mason, Sherie Rene Scott, Seth Allen, Phoebe Snow, Jasmine Guy, Randy Brecker, Marni Nixon, Chapman Roberts and Christopher Walken. His numerous awards include both the Bistro and MAC Award. www.darylkojak.com.